Laurels don’t just grow on trees. Well, they do but they’re not dished out to every green thumbed garden designer, that’s for sure, as JON RAWLINSON explains. Since Christchurch (aka the garden city) last hosted the Ellerslie International Flower Show a few years back there’s been a bit of a drought when it comes to harvesting awards for first class garden design. So, as EastLife’s December issue went to print, we were thrilled to hear that an Eastern Beach local was one of the first to taste the fruits of victory at the event’s new incarnation, the NZ Flower & Garden Show. The display garden was specifically designed to show how small spaces can be best used. “It was based on a Chess game – the pieces are the plants in pots and the vertical gardens are the moves to create corridors of vegetation from the mountains to the sea, the Eastern Beach local confirms. Leigh and team were up against some top competition, with gardens judged to an international standard. Hanging Gardens’ win is especially sweet as this is just the second such competition the team has entered ñ they claimed medals at the last Ellerslie show in 2014. “There are few International standard garden shows and this one is vitally important to illustrate to people from around the world what is happening here in New Zealand. There are so many fantastic aspects of our horticulture and landscape design needs to be shown to the world,” says Leigh. Asked if she will be getting straight back to the drawing board with a view to claiming further accolades next year, Leigh is characteristically enigmatic. “Last time, I said – never again because so much work goes into planning and executing a display garden that it’s exhausting. But, give me a bit of a break, and I might forget all that and only remember how much fun it is to be involved,” she laughs. To read EastLife’s 2014 interview with Leigh, see March 2014 e-edition, via eastlife.co.nz. When judges picked winners at the NZ Flower & Garden Show recently, the top crop of designers proved their green-thumbed efforts were as good as gold. “Leigh’s vertical garden was a real showstopper. People could really relate to her design and see how it would work in their own homes,” event director, Kate Hillier, says of Hanging Gardens. 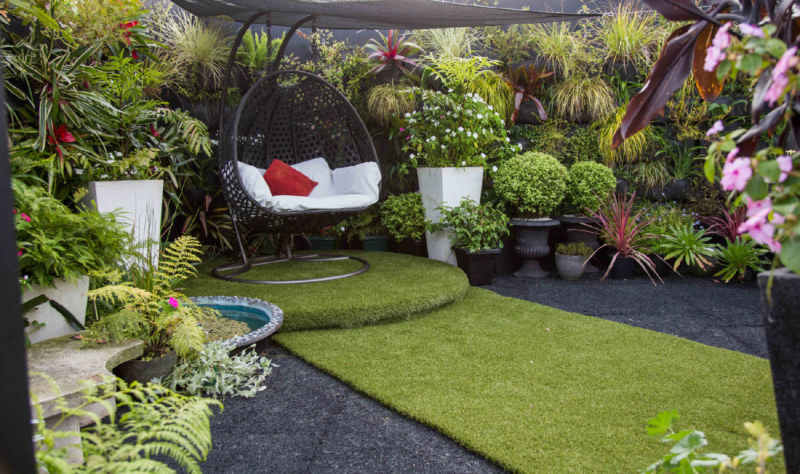 New Zealand has been without a major annual garden show since the Ellerslie Flower Show (then based in Christchurch) wowed crowds for the final time in 2014. Although this new incarnation began with a rocky start – its first show, scheduled to run last year at Bastion Point was cancelled – the NZ Flower & Garden Show now appears to have found fertile ground in Henderson. “We’ve signed for 2018 and 2019 at the Trusts Arena, so you can be sure we’ll be back!” adds Kate. For 2017’s winning garden designs visit nzflowergardenshow.co.nz. Disneyland who would miss it?